The guitars I build result from my extensive study of handmade guitars, from the earliest to those of today, coupled with my experience and commitment to the art and craft of instrument making. 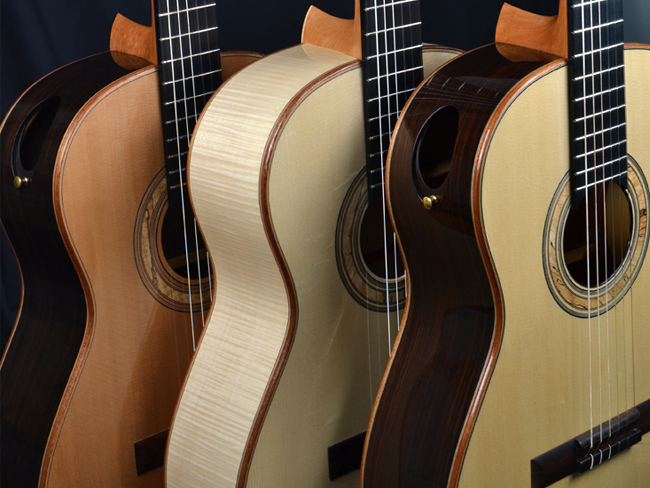 Working within this tradition, using the same century’s old methods and materials, my guitars resonate with the timeless, melodic voice of the Spanish classical guitar, whilst at the same time working within a contemporary design and aesthetic idiom. I aim for a sound that enables the player to express themselves through a variety of colours, long sustain and a wide range of dynamics, coupled to the volume and projection that a classical concert guitar requires. 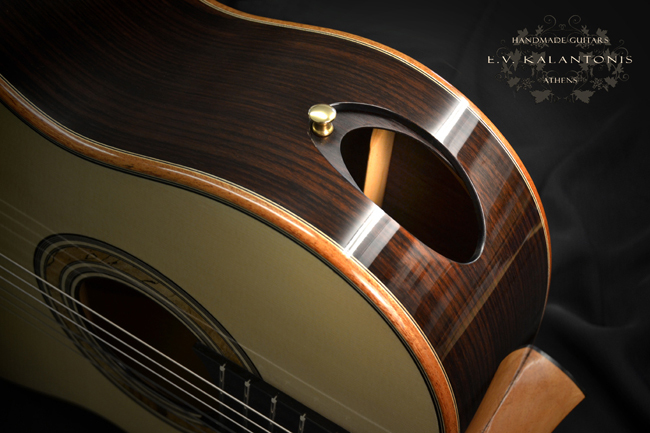 Exclusively master grade tonewoods are used for my instruments, all finished with a high quality French polish. 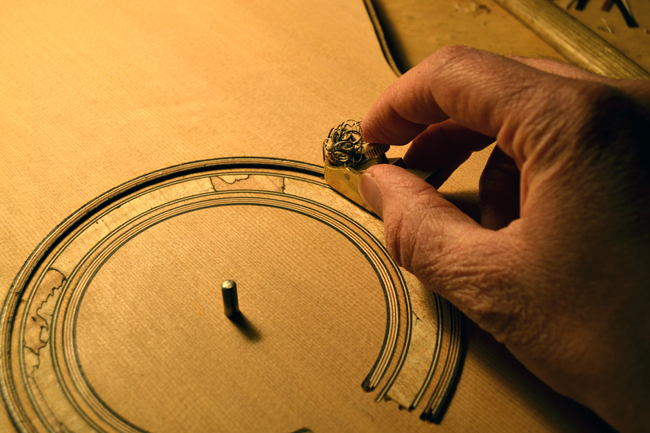 The sound portal, or soundport, is usually an oval hole at the side of the guitar, which works together with the hole of the soundboard. The first experiments began in the 90s in Canada and the United States. However, if we take a closer look at European instruments of previous centuries, we see lutes, mandolins and other instruments with an additional hole (or holes) on the side. This extra hole allows for better air flow in the guitar body, making its frequencies richer and more productive, enabling greater distinction between the notes along with better projection. In addition, the position of the hole under the player’s left ear (for the right handed), functions as a kind of natural monitor allowing the player to listen better to the sound they create, to hear their guitar in stereo, which is very pleasing. An interesting aspect of the soundports I make is the sliding door construction that allows the player to open it as much as they wish; or even to close it completely. This alters the resonance of the air chamber 4 semitones so the main frequency of the guitar can actually be “tuned” accordantly. Further, it is a particularly interesting aesthetic element that makes the guitar stand out. 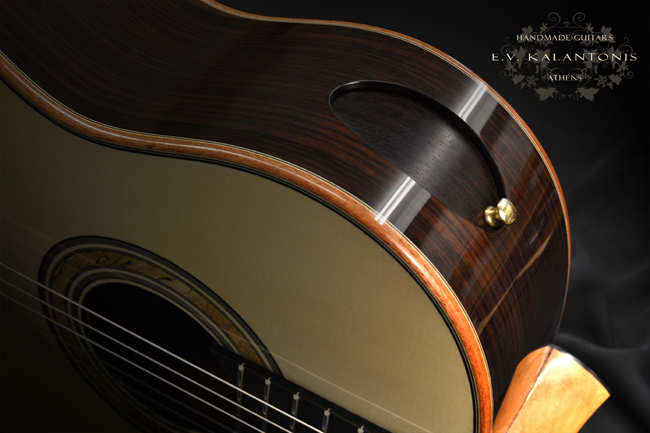 The guitars are built in a humidity-controlled environment, between 40-50 percent humidity. The ideal conditions for keeping a guitar after it leaves the workshop are a temperature of between 18-26 degrees Celsius and humidity between 45-55 percent. If the guitar is always kept close to these conditions and is not exposed to sudden humidity and temperature changes, it will remain in excellent playable condition.